With the end of the year fast approaching, many companies will be starting their employee performance review processes. Often, this will mark a moment of dread and discontent, but it doesn’t have to be that way. There are many reasons the employee performance review is not a time that anyone looks forward to. If you’re not ready to get rid of the performance review entirely, these approaches can help make them a better experience and give you ideas for tweaking what you’re already doing. 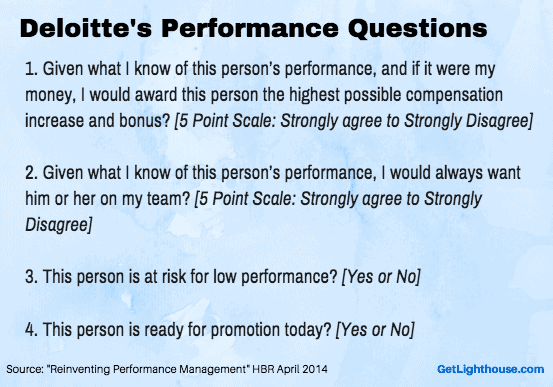 There are no silver bullets in the evaluation of employee performance. These ideas can help you think about ways to make solid, incremental improvements that address some of the biggest problems with reviews today. Stack ranking became popular in the 1980s thanks to Jack Welch and GE popularizing the “rank and yank” approach. This approach required a certain percentage of every team had to be ranked as exceptional and another percentage had to be ranked poorly and possibly terminated. While this solved the problem of managers marking everyone middle of the road, it created many new problems. Competition discourages collaboration: When you’re ranked against your colleagues, you’re incentivized to fight with them over recognition and work. You can’t afford to risk letting someone else get the credit for a big win you worked on, and some may even consider sabotaging their colleagues. Politics are more strongly rewarded: When a manager can only rank a few people on their team high, being your boss’s favorite becomes much more important than when you are evaluated individually, and on merit for your contributions. “By 2002, the by-product of bureaucracy — brutal corporate politics — had reared its head at Microsoft. And, current and former executives said, each year the intensity and destructiveness of the game playing grew worse as employees struggled to beat out their co-workers for promotions, bonuses, or just survival. With all this mounting evidence and horror stories, it’s no surprise that the trend today is to stop using stack ranking employees. If your company is still ranking, take a hard look at whether the damage other companies experience is happening at your company and consider a change if that proves true. You might just be able to take some of the dread out of performance reviews if you do. Whether you rank your people or not, the most important decision you make in your evaluations is the questions you ask. What gets measured, gets rewarded or corrected. What doesn’t is ignored. Did the sales person hit their number? How many leads did marketing create? Did their team ship the features they were expected? Those are important questions, but miss many long term indicators of the health of your business and various teams. Knowing that employees leave managers, not companies, the questions you ask to evaluate your managers are particularly critical. A results-only environment may look fine in the short term, but as employees burn out, leave, or become disengaged, managers that get positive results for the wrong reasons will be exposed. And leaders in an organization will be left with the bill. Notice how many of these questions play the long game? They’re truly telling whether a manager is doing the things that will motivate and retain their employees. Do the questions you ask in evaluating managers do that? What about evaluating team members?!? The right questions can make all the difference between a biased, unhelpful review, and an accurate, productive one. One of the common habits of many companies is to include how much of a raise or bonus you will receive as part of a performance review. That turns out to not be good for anyone. When compensation and performance are combined, it’s hard for any feedback to be well-received. Instead, team members often feel like they have to respond to each piece of feedback or risk having it affect their compensation. Performance feedback can also be largely ignored as the team member solely focuses on the dollar amount discussed. And they’re not alone. Google and Deloitte have similarly separated their discussions and also seen positive impacts. 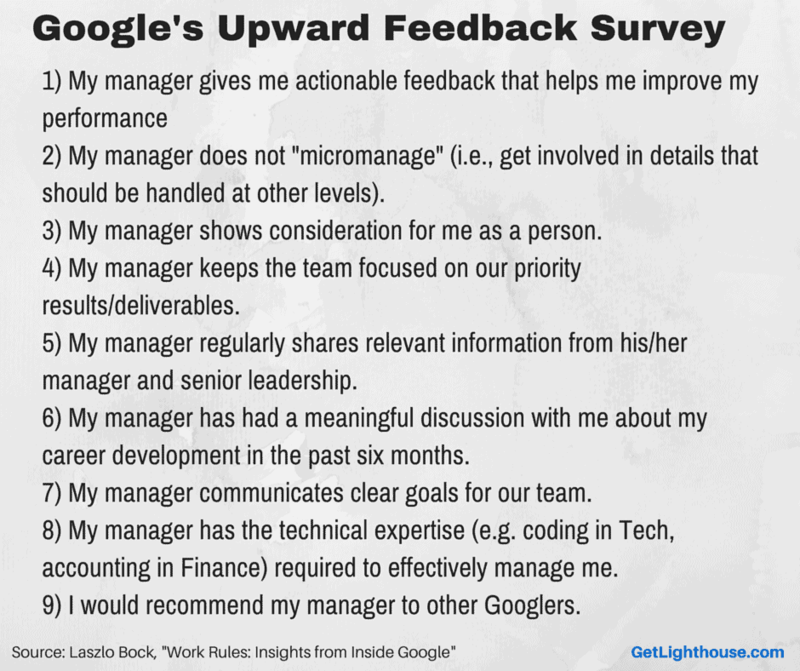 And for those not looking to get rid of their annual employee performance review yet, you can follow Google’s suit. They pushed compensation discussions to a month after the performance reviews; annual reviews happen in November, and pay discussions happen in December. Some of the most data-driven companies in the world have tested and seen great results in separating the two discussions. Consider putting a break in between your performance and compensation discussions and see how it works for you. Just make sure your team member knows you’ve made the split so they’re not expecting both at once. Ongoing, regular feedback: Rather than getting a laundry list of ways to improve at the end of the year, good one on ones can help make adjustments throughout the year, as they happen. Fix problems when they’re small: If you catch an issue early, it’s much easier to correct. This is equally true if something is bothering a team member and could make them quit, as it is fixing a performance issue that could eventually force a termination. A full record of the past year: One of the biggest problems in reviews is managers depending on their memory. This leads to annual reviews based on the last few weeks only. If a manager takes notes in one on ones, they’ll have a great record of the last year to reflect on. These all not only improve the performance of your team, but ensure no matter the style of your reviews, you will have helpful things to write and reflect on. Deloitte was spending close to 2 million employee hours per year on reviews. GE found that there was a fivefold productivity increase in the past 12 months for their test group that switched to one on ones. Adobe saved almost 80,000 hours of their manager’s time on reviews, and saw a 30 percent reduction in voluntary turnover. What if I want to keep my performance reviews? Pick up where you left off: If you just gave someone a bunch of feedback, ongoing one on ones are the perfect time to continue to talk about improvement in those areas (especially if there’s opportunity to praise improvement). Ensure career growth: One of the biggest mistakes we see managers make is only talking about career growth at review time. A lack of progress between reviews is a sure-fire way to have your best people seek growth opportunities at new jobs. Make progress: A one on one gives you a set time to regularly talk about everything that doesn’t fit in your regular work schedule (like items from your performance review). Helping them feel progress on what matters most to them is a powerful source of motivation. One on ones are a powerful way to make an employee performance review relevant year round. They’re also a great habit with a major return on investment for managers to better motivate and engage their teams. Memorable: The words are usually adjectives to describe you. That makes it clear what you should do more of or less of over time. Actionable: It’s hard to always find the takeaway in a multi-paragraph review entry, but if someone says you’re “Inconsistent”, you know what you need to change. Thematic: If you ask multiple people, you’re going to hear some consistent words and themes across 5 word reviews. This can really help you with your self-awareness and understanding how others perceive you. This constraint also forces creativity. With only a few words to choose, they must focus on the handful of most important words to convey to you. That prioritization helps ensure the most important message is heard. The other major benefit to this method is that you absolutely have to to have a face to face conversation about the words. This helps avoid any misunderstanding and gives you room to have a healthy discussion about the meaning behind each word chosen. If you follow English’s advice and make it an informal discussion outside the office, it will also help take some of the tension out of being evaluated. Of course you don’t need HR to do a 5 word review. This can be a great exercise at any time throughout the year to get constructive feedback from your team. 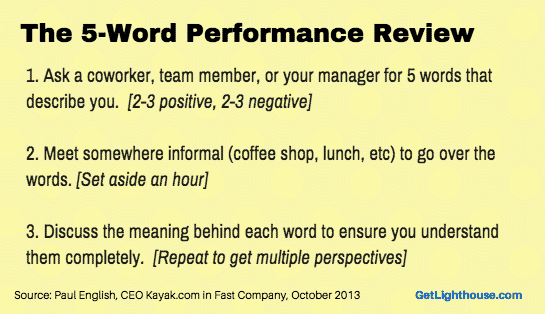 You can learn more about the 5 word review and an example from Kayak founder Paul English at Fast Company here. Evaluating performance is an important part of ensuring you and your team improves over time. While many dread the employee performance review, with a little experimentation you can turn them into the effective management tool you hope. These are just a few of the ways you can improve reviews at your company. 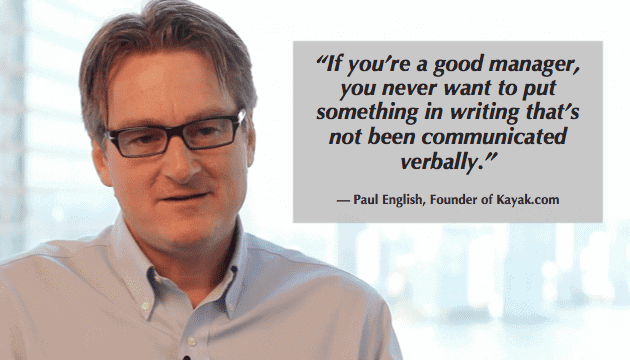 What advice do you have for those looking to make their performance reviews better?